Well, I'm a bit nervous because I never have posted anything in the University Forum, but this question is in a few posts throughout the Aok heaven forums, and I have some information regarded to it, by testing infinite times on this subject: changing the User Interface. Every mod has to have a properly designed UI for each civilization. It's not very accurate that the new civilization of the -for example- Zulus to have an User Interface from the Japanese or the Goths. A Total Conversion Mod is specially praised if it has unique designed UIs for each civilization changed. Let's take for example my A Song of Ice and Fire mod, a Game of Thrones. Its really a buggy thing that the Night's Watch, namely the Man in Black, builded in the place of the Koreans, to have the colorful blue and red UI from this civilization. So we have to change it. For doing this, we have to use one of the grahic programs: Mod Pack Studio, Turtle Pack, or the many others. I prefer the Turtle Pack. It's very user-friendly, and, altough it has its tricks, it's an easy program to use. With Mod Pack Studio we can do it anyway, but you have to replace the gaphics, and you cannot add new ones -but, for this topic, it would be useful anyway. Once we have chosen the program, it's time to open the library, and found the graphic we want to replace. The Interface Graphics are in the Data folder, in the Interfac.drs library. We can open it with the DRS editor of Turtle Pack, a program that allows us to see, extract and replace the SLPs that we want. 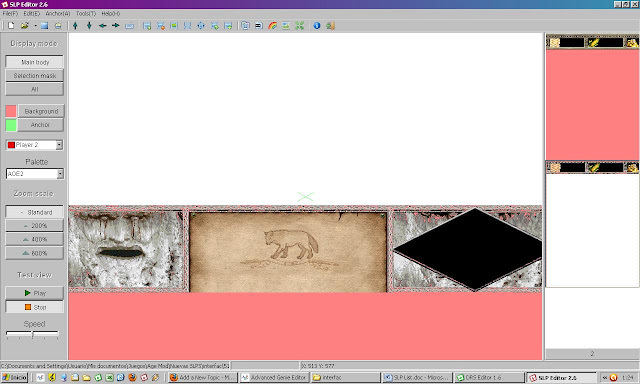 Then we can use the SLP editor to see, extract, create the SLP or replace the bitmaps from an existing one. 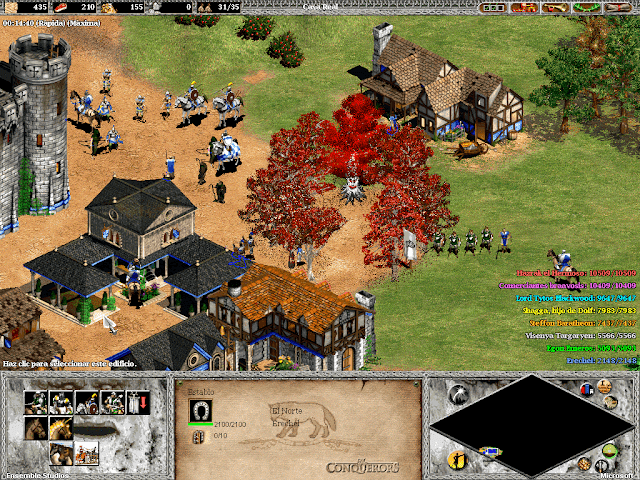 Small, medium and large are the sizes used by the game for different screen resolutions. Make shure that you make one UI for every size, or at least warn the downloaders that you only have changed the UIs in x resolution. The equation is simple, larger resolutions use larger UIs. There you choose what to replace. Let's discuss something else. I've cracking my head on the walls in this particular topic: You extract the SLP, then you go to the SLP editor and extract the bitmap, then you edit that, and try to replace the bitmap in the SLP with the new one. It's all there, I'll wait until you have learned the basics of the program. The transparent (white) screen is white, and there it is all sort of odd transparencies troughout the UI (background in pink). This is because the program recognizes the last line as the transparent mask. It doesn't really matters that you choose auto transparent or 255: if you try, every time the program launches the same values. Cheers, and I hope it could be useful. -PD-By the way, excuse me by my english. I'm a spanish speaker with only High School english lessons. Great tutorial, Erechel. But do you know how to make interfaces for expansions and not convertion mods? I suposse that it's the same thing. I did not really made an expansion, so I do not know how to refer a civilization to a specific Interfac SLP. I'm limited to work with things that are already in game. I recommend you to explore expansions and see what is different in the Interfac.drs. This article has been added to the University! - UserPatch doesn't show the middle picture of the lower interface bar, except for old resolutions. It uses parts of the middle image (the corners) to generate a repeating pattern with which it fills this part of the interface. This is done to accommodate different length of the interface bar for different resolutions. Similar method is applied to the top interface bar as well. - When adding new civilizations with UserPatch (it's the only way to do it), you set the number of additional interface slp files in the .xml file of your mod. The parameters are listed in the Adding New Civs Tutorial. Most people will use UserPatch at least for the resolutions, few will want to play in 1024x768 or 1280x1024 (the original resolutions), so these notes have to be considered. UPatch HD - the unofficial (HD) patch for Age of Empires: The Rise of Rome - HD resolution, HD quality interface graphics, hundreds of bug fixes, new gameplay options and many other enhancements. --- Download here (version 1.1 Release 3). --- For more information visit the site. Thank you, guys! I've have not being in this forum for a long time now -I became a father, so...-, but now I'm back on the track! It's a very good tutorial, the only thing that bugs me a bit is that a great part of it is about Paint. With Gimp and Photoshop CS2 being free, I feel it's a bit unnecessary as they work very different from paint and are capable of much more so more people will use those programs instead of paint. I checked the data set of the new expansion (African Kingdoms). There is no interface.drs rather all the slp files are individual. However, the user interface slp's you mentions (i.e 5xxxx) don't exist there. Do you know how to locate these files in the new expansions? @ Vardamir: Ok it looks like they changed the interface slps. The 5***** slps in gamedata_x2 folder are there but the game runs fine even if I modify/remove those files. So I digged in a bit more and found "game_b*" slp files in "in resources/_common/slp" and this slps are numbered from 1 - 27. Changing them affects the civ interfaces, so for example Berber is slp 27. There is one issue though: in Turtle Pack these slps appear with messed up colors, and its impossible to see the designs. I am trying to edit UI in Userpatch version. There always seems to be weird white/pink lines in the top and bottom edges. Is there any trick to get rid of it? Also there is a persistent white line in the upper edge of the middle-bottom panel (i.e the civ symbol part that Userpatch repeats to make larger resolutions). I have tried the methods mentioned in this article and its still there. Hey, that article was helpful The interface color palette works better I think when using Turtle pack to determine the blank colors. I figured out the reason of the lines after playing around for some time: I didn't untick the "auto selection mask" box when importing an image. If it is selected, it automatically creates a pixel of blank border around the image so the image size changes slightly (1024/768 becomes 1026/770) and the game renders the that image. Also, another issue regarding slp: some slp files give an error "failed to decode slp images". Its happening with the Mongol's UI (HD version, file game_b12) and I can't open it. Any solution to this? Thank you. This is a very useful article. I found a similar article, it may be useful for someone. You are so getting banned mate.